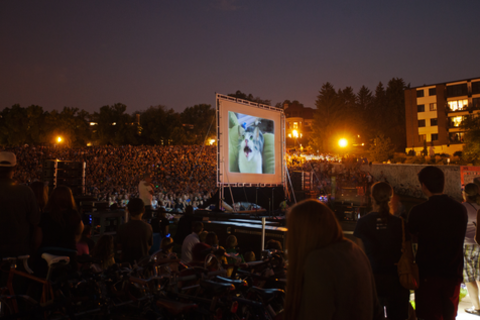 On August 30th, 2012 over 10,000 people gathered at the Walker Art Center in Minneapolis for the first Internet Cat Video Festival (#catvidfest). What began as a social experiment testing the boundaries of online communities and crowd-sourcing content resulted in attention from local, national, and international audiences and press and raised public debate around the role of museums in an internet culture. Fractious questions were raised about the relevancy or ridiculousness of the event and the role of the curator in a crowd-sourced environment. Using #catvidfest as a case study, we will question what it means for a museum to reflect contemporary culture in the era of YouTube, explore the challenges traditional institutions face engaging online audiences and share what we learned from transforming a solitary online viewing experience into a real world social event. This session will include cat videos. Katie Hill is a museum professional, art historian, cat lady, internet nerd, writer, and the Audience Engagement Specialist at the Minneapolis Institute of Arts. She created the first Internet Cat Video Festival (#catvidfest) which took place at the Walker Art Center in Minneapolis, MN on August 30, 2012. Katie likes to make connections, engage broad and niche audiences with art and museums - both online and in real life - and she strives to become a leader in her field. She also loves social media and pop culture, despite her graduate degree in art history. Scott Stulen is an artist, dj, curator, and programmer of Open Field at the Walker Art Center. He has created and developed innovative on and off-line programming including Community Supported Art (CSA), Drawing Club, International Headphone Festival, Analog Tweets and the first Internet Cat Video Festival #catvidfest. Stulen is the Director of mnartists.org, an online art hub serving over 20,000 Midwest artists, director of the McKnight Artist Fellowship for Photographers and former Associate Curator at the Rochester Art Center.